My house can carry some interesting smells these days. Everything from messes that my children make to baking and cooking that I love to do. The smell of burnt toast and of French Onion Soup cooking on the stove, smells of dirt and mud and smells of freshly washed sheets. Yep! We get it all here! Some smells are less desirable than others (you know what I'm talking about here) and sometimes, you just have to get them out of your house. My first go-to is always opening the windows. That seems to work the quickest in a pinch but sometimes, you just can't open the windows for whatever reason sooo...it's good to have some air freshener products on hand for those times. Growing up, my mom was severely allergic to anything scented and even to this day, she has a hard time being around certain scents. This is why I am so happy to hear that Renuzit has taken people like my mom into consideration when creating their products. 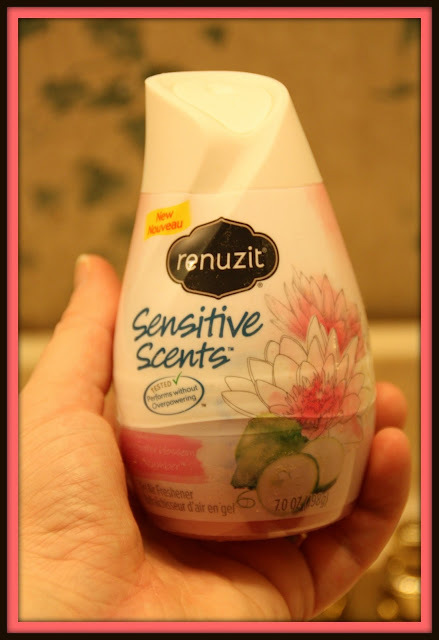 So, for this review I was sent some of the products from the Renuzit Sensitive Scents line. I was sent the Pure Ocean Breeze Scented Oil, Pure Water Blossom & Cucumber Air Freshener Cone and the Pure White Pear & Lavender Odor Neutralizer Spray. I absolutely love the packaging of these products...they are so fresh and clean, warm and homey too. The Ocean Breeze Scented Oil was the first product that I tried. 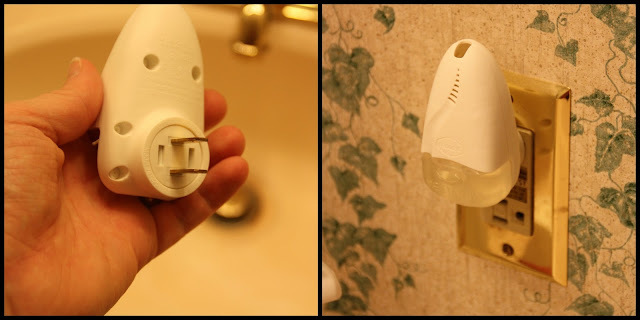 You are not supposed to install this into your electrical outlet tipped to the side, so Renuzit designed the plug on the oil diffuser to rotate to accomodate plugs that are sideways. This was sooo handy because the bathroom that I wanted this oil to go in, only had sideways plugs. The only issue I had was trying to rotate the plug by hand was nearly impossible...I had to stick it into the outlet and then rotate it. Other than that, it worked great! Within minutes of installing, my entire bathroom smelled like tropical coconut. Not only did it fragrance my bathroom, but the entire first floor of my home where my bathroom is located. I was impressed (at first it was a bit overpowering but now that it has been on for 24 hours, it has mellowed out quite a bit)! I wish there was an on/off switch built into the diffuser though so I could turn it off it I didn't need it. This diffuser keeps my bathroom and house smelling fantastic though! I love air freshener cones. This one is no exception. It smells completely and utterly refreshing, very nice addition to any room in your home. I love using these in my bathrooms...I have 2 bathrooms in my home so there is always some sort of freshener in each one. Typically, air freshener cones last about a month but sometimes, I get one that lasts a bit longer. This one has been working for a few days now and smells wonderful! I can't wait to see how long it lasts! Oh, and they look beautiful sitting on your sink, toilet tank or wherever you put it. Love how it just blends in with my decor. Last but not least I am loving the odor neutralizing spray. 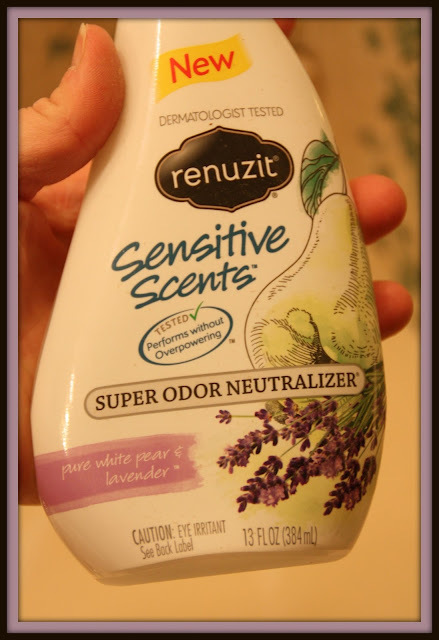 Lavender is such a soothing scent and makes a perfect air freshening spray. I have one child that is in diapers and another who wears pullups at night and underwear during the day so you can probably imagine what my nursery smells like on occasion. Sooo, I always have some sort of spray handy in that room of my home. This one is amazing...it is perfect for Rebekah's sensitive baby nose and strong enough to get rid of icky smells when they happen to arise. 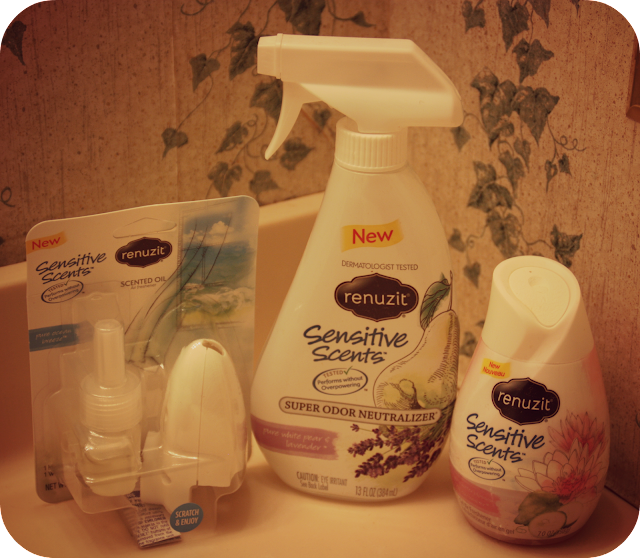 So, if you are interested in trying out any of these new Sensitive Scent products from Renuzit, you can find them at major retailer stores across the country. I am definitely going to keep my eye open for them in stores around me and am looking forward to seeing if they come up with any new scents when the holidays roll around again! 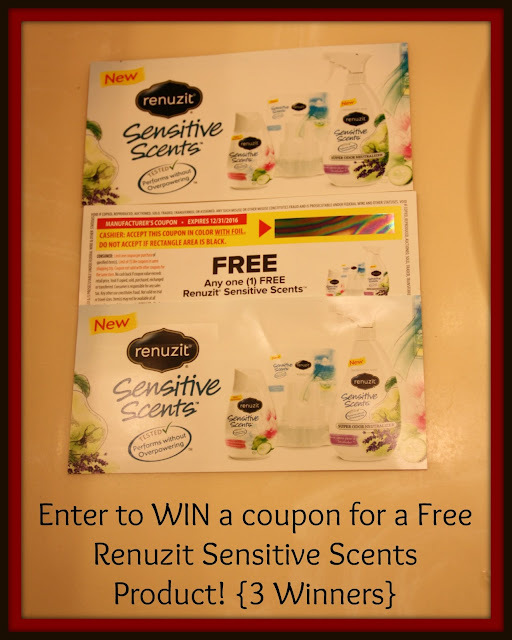 Be sure you check out Renuzit on Facebook as well...always something fun happening there. Disclaimer: I received no monetary compensation for this post. I did receive free products for review purposes. All quotes and stock photos are from the sponsor's website and email. Prize is being provided by the sponsor. This blog is not responsible for lost, stolen or damaged prizes. All thoughts and opinions are 100% mine. I would love to try the Purely Peach scented spray. I want to try the Adjustable Cone in the Ocean Breeze scent. I lve the fresh Lavendar scent. I'd like to try Simply Vanilla. I'd like to try the ocean breeze scent. I think the Pure Ocean Breeze scent would be nice. I would like to try the Pure White Pear & Lavender. I want to try lavender. I am most interested in the pure ocean breeze scent. I'd like to try the Lavender spray! I would like to try the ocean breeze scent in the cone. I'd like to try White Pear and Lavender. I would like to try the Blue Sky breeze scented pearls for both of my bathrooms. I would love the Pure Ocean Breeze scent. I want to try After The Rain! I want to try the Hawaiian Oasis cone. The water blossom and cucumbers. I love the AromaHappy scent! We use the AromaHappy cone in our bathroom. I think I would like the Pure Breeze spray. I love tropical or fruity. I would like to try the Tahitian Breeze. I want to try the Pearls Sparkling Rain. Pure Water Blossom & Cucumber. I'd like to try the Serenity Pearls. I would love to tray the Pure Ocean Breeze cone. I would like to try the pure ocean breeze. I would like to try the Apple & Cinnamon CONES. i want to try the ocean breeze scent is sounds nice. I would like The Pure Ocean Breeze! I'd like to try the Pure Ocean Breeze. i have to go with the ocean breeze scent. I would like to try the Serenity Pearls. Pure Breeze would be my scent of choice. I would like to try the White Pear and Lavender scent. I'd like to try the Sparkling Rain Pearls. I'd like to try the Citrus Orchard cone. I would love to try the Pure Ocean Breeze scent most of all! i would love the raspberry scent! I'd like to try Tahitian Breeze. I would like to try the Pure White Pear & Lavender spray. I would love to try the apple & cinnamon cone!